Contents: Part I Defining Urban Sustainability: A new framework for urban sustainability governance; Sustainability in five principles; History of sustainability in the United States and Germany. 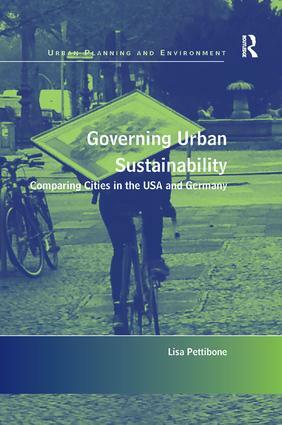 Part II Urban Sustainability Governance in Six U.S. and German Cities: The instruments of urban sustainability governance; Creating a vision: strategic plans and urban sustainability; Quantifying values with sustainability indicators; Building motivation: sustainability-minded groups. Part III Realizing Sustainability Principles in Urban Sustainability Governance: Reconceptualizing urban sustainability governance; Conclusions. Bibliography; Index. Lisa Pettibone is a research associate at the Museum fÃ¼r Naturkunde Berlin, where she works on citizen science and participatory research, with a particular interest in transdisciplinary sustainability research. She earned her doctorate in political science at the Freie UniversitÃ¤t Berlin and has degrees from the George Washington University and New York University. Dr. Pettibone has worked in the U.S. Senate and the German Bundestag, as well as for the non-profit organization Citizens For Europe.